You can choose to plant a fruiting mulberry tree for yourself or for your birds! Since the birds are so fond of the berries, the trees can be used as a distraction to keep the birds from eating other fruits. The mulberries have a unique flavor; if you choose to harvest them for yourself, they are delicious picked fresh or dried and can be used in jellies, jams, pies and mulberry wine. They also freeze well. Mulberries are planted throughout Europe and they are mentioned in the writings of Virgil in Rome before 20 B.C. The trees are very long-lived; one of the oldest remaining mulberry trees is over 350 years old and is found in a village in Korea. As the trees age, they become picturesque additions to the landscape. The White Mulberry is the tree of choice for silkworm culture. It was originally brought to the U.S. to start production among the Chinese population in Nevada City, California. 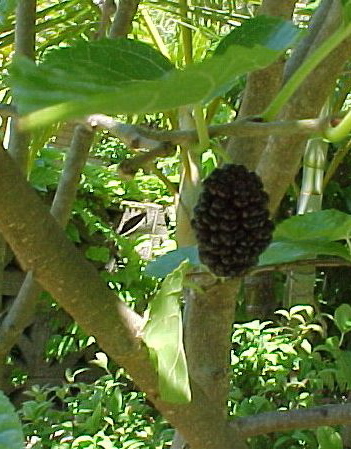 Mulberries usually bear early and have few serious pests or diseases. They are tolerant of most soils, but perform best in good soils. They prefer hot, dry summers and are quite drought tolerant once established. They are one of the few berries that grow on trees. Continuously produces sweet, blackberry-like fruit throughout the season. A great choice for containers. Mature height is six to eight feet in the ground. Zones 7 to 11. Self-fruitful. Potted. Large maroon to black fruit is 3 1/2 to 5" long and very sweet with a raspberry-like flavor. Multi-month long fruiting season. Cold hardy to USDA zone 9, maybe 7 when mature. Frost sensitive when young. Sweating is recommended in dry, cold or windy climates to encourage bud break (see the article on sweating under the Growing Fruit Trees tab on the home page). Self-fruitful. Medium size, sweet, white fruit shaped like blackberries. Large, handsome mulberry tree grows moderately to 20-60 feet. Drought tolerant once established. Cold hardy to zone 6. Self-fruitful.